Sakai Guides and DocumentationSakai Complete User Guide AssignmentsHow do I enable student peer review for an assignment? Add a new assignment or edit a draft assignment. Or, click Edit to edit a draft assignment. Note: You can only select the peer assessment option for a new or draft assignment. Once the assignment has been posted for students, you cannot change this setting. Choose Points as the grade scale and enter a maximum point value. In order to use Peer Assessment, the assignment must be set to a Points grade scale. Under Additional Assignment Options, select Use peer assessment. Zoom: Under Additional Assignment Options, select Use peer assessment. Peer assessment facilitates student peer review of assignments. Whether or not reviews are anonymous. Whether or not students may see reviews of their own assignments. The number of reviews each student must complete. Note: You must be using a Points grade scale in order to enable peer review and it cannot be a group assignment. Prev: How do I edit an existing assignment? 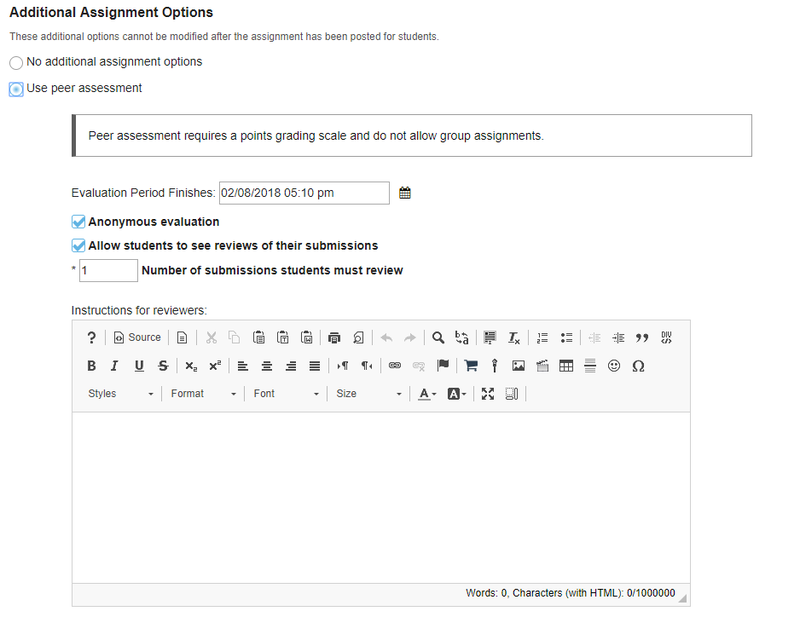 Next: How do I enable group submissions for an assignment?